I’m not going to wrap this up in my usual 4348390 words incase I somehow lose the point of this post. Let me simply tell you that I experienced a miracle this morning (yesterday morning by the time you’re reading this!). I worked a blob of the new Pantene Colour Seal Concentrate through my hair last night after doing the usual shampoo/conditioner routine, left it on for 2/3 minutes and rinsed it out. I went to bed with wet hair, fully expecting to regret my laziness the next morning and instead woke up to the softest, smoothest hair I can remember having. The coarseness had completely disappeared and I was able to gather my hair into a smooth ponytail with ends so sleek that I couldn’t stop stroking them. It’s now 13 hours later and my hair is sadly starting to feel a little more like it’s usual rough self so I’m not sold on Pantene’s claims of long-term effectiveness… still, even a full day of glossy locks has brightened my mood. Yes, I’m as shallow as that last statment makes me appear. I don’t care how it works (probably silicones, smoke and mirrors), I just care that it makes my hair (temporarily) very happy. 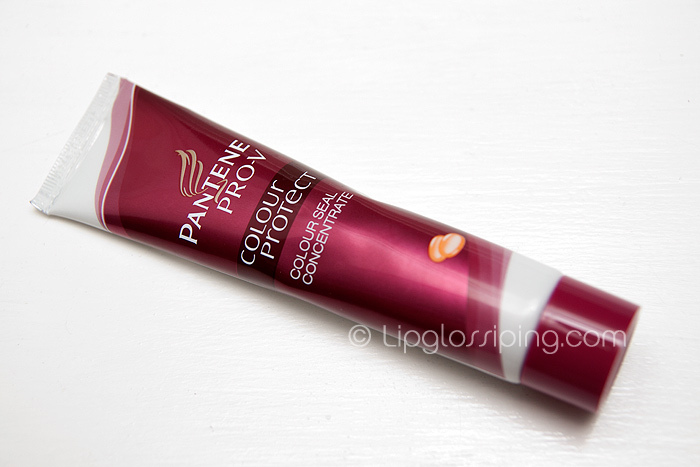 Pantene Colour Seal Concentrate should be available in your usual Pantene stockists now as part of the Pro-V Colour Protect range, it’s priced at £3.99 and I really recommend that you stop whatever it is you’re doing to go and buy some. I’ve only used it once and had to post on the softness/smoothing effect.. can’t comment on prolonging colour yet. I’ve never really found any colour products make that big a difference though – have you? Am giving this a go tonight having backcombed the sh*t out of my hair today, and expect miraculous results! I’ve been using the shampoo & conditioner from the range for a couple of weeks and am generally impressed. It definitely has the promised smoothing qualities and makes my hair much easier to manage, though it is quite heavy on the hair. Have Royal & Langnickel ushered in a [R]evolution in makeup brushes?